By all appearances, Lionel Edward “Leo” Nicholson was born in 1894 with a proverbial golden spoon in his mouth. His father Edward was a Winnipeg grocery broker who could afford the best for his kids. Young Leo and his older sister Mae were frequent playmates with the children of the city’s social elite. Their violin and piano performances were featured on the cover of Town Topics, the city’s arts and culture magazine. Their mother Madge was one of Manitoba’s first automobile owners, and she often took her two children on “road trips” to rural Manitoba and the USA. The Nicholsons summered at the large family cottage on Lake of the Woods, entertained guests at the St. Charles Country Club, or took extended holidays in Europe, Japan, and China. They enjoyed the mineral waters of Hot Springs, Arkansas, and they wintered in California, Bermuda, and other sunny locales. As a teenager, Leo attended private school in Wisconsin, and raced his mother’s car while home on holiday. And, after a tour of duty as a dashing fighter pilot with the Royal Naval Air Service in the First World War, Leo married a movie star. Leo returned from the war with a 19-year-old English bride named Lillian Rich. They settled into a comfortable home on Oxford Street in Winnipeg. The 5' 3" dark-haired beauty must have immediately captivated her new father-in-law’s heart. Seeing a future for her in Hollywood, Edward Nicholson bankrolled Lillian with $1,000 of his own money. 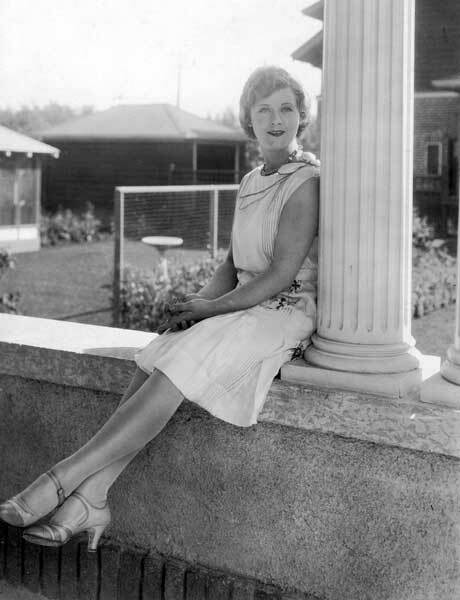 She had publicity photographs taken in the summer of 1919, including one of her lounging playfully on the porch of her home, then headed off to Tinsel Town. Lillian Rich in Winnipeg, 1919. With Leo as her manager, Lillian’s found immediate success on the silver screen. Her first role in the 1919 movie The Day She Paid was followed by a flurry of roles, mostly dramas and Westerns with such stars as Tom Mix, Jack Hoxie, Harry Carey, and Ed “Hoot” Gibson. She made five movies in 1920, seven in 1921, and six in 1922. Then, none in 1923. What happened? Her “sugar daddy” father-in-law, having sold his business in 1917, died that year in California after a long illness. Leo accompanied the body back to Winnipeg for burial. Lillian apparently decided that her marriage to Leo was now a liability: she locked up their California house and divorced him. Soon afterwards, her career was back on track; she appeared in six movies in 1924, and eight in 1925. Her career hit its peak in 1925 when she played “the man-eating, social-climbing Flora in Cecil B. DeMille’s extravagant The Golden Bed. She played her femme fatale in a blond wig and the New York Times thought she looked ‘extraordinarily beautiful.’”  The next year, a role in the railroad movie Whispering Smith would be considered her only other notable performance. Her movie output waned gradually in the early 1930s. Like many silent film stars, Lillian probably did not have a voice to suit the “talkies” that were becoming common. Her career ended in 1940 after a series of uncredited roles as nurses or telephone operators, and she died quietly in January 1954. Leo, meanwhile, looked for other employment in California. He allegedly tried his hand at directing movies although there are no records on what ones he made, if any. Then he had the idea of becoming a sports journalist in the new medium of radio, and began broadcasting football games in Los Angeles under the sponsorship of an automobile agency. In 1930, he moved back to Canada where, in Vancouver as kindly “Big Brother Bill”, he created a radio program to feature talented local children. His love of sports reporting reasserted itself, however, and he began calling “every sports event that has a book of rules” , including bicycle races, softball, golf tourneys, and salmon derbies. He announced home games for the Montreal Canadiens hockey team in 1941 and, for a time, wrote a sports column for the Vancouver News-Herald newspaper. Known for his rapid-fire elocution, Leo was widely credited for popularizing box lacrosse in Canada, and for describing it as “the fastest sport on two feet.” He remarried but had no children. He worked vigorously on behalf of Vancouver charities and war bond drives, but he died after a brief illness at a young age, just 52, in October 1947. Like his movie star first wife, there is no indication that Leo Nicholson ever returned to his home town and, like her, he is virtually unknown today. But for a brief time just after the First World War, a silent film star was born on a quiet Winnipeg street, and nurtured by a wealthy local businessman whose son later “made good” as one of Canada’s first sports broadcasters. 1. Lillian Rich’s filmography can be found on several Internet sites, including http://us.imdb.com/name/nm0723678. 4. “Leo’s Life Was an Exciting One”, Vancouver News-Herald, 29 October 1947, p. 10. 5. “Leo Nicholson Funeral Set for Thursday”, Vancouver Sun, 29 October 1947, p. 1. 6. “Boxla’s Popularity Due Greatly to Leo’s Voice”, Vancouver News-Herald, 29 October 1947, p. 10. A series of minor misadventures in Victoria, BC in late 2004 eventually led me to photograph albums compiled by Mae Nicholson Bawlf, sister to Leo. Among the wealth of information contained in them were clues to Lillian Rich’s brief residence in Winnipeg. I gratefully acknowledge the assistance of Alexandra Bawlf, her sister Virginia Bawlf, and her cousin Nick Bawlf (all of them descended from Winnipeg grain merchant Nicholas Bawlf), as well as Professor Gene Walz, in piecing together this little-known historical tidbit.